Google officially shuttered its web energy tool PowerMeter Friday after the application failed to bring in enough users. For those who have watched PowerMeter’s slow slog over its two-year lifespan, the move to kill it isn’t all that shocking. But the application, which enabled people to monitor and manage their home energy consumption, does have an important legacy as one of the first examples of how the Internet and broadband will change the way people consume energy. 1. It’s early. The market for energy management tools is still in a really early stage. Consumers are largely unaware of the tools and technologies available to monitor and manage their own energy. The Consumer Electronics Association found that 64 percent of consumers are unaware of electricity management programs, and 66 percent of consumers aren’t familiar with the smart grid. Google (s goog) launched its PowerMeter tool in early 2009, when very few smart meters and smart grid network deployments had been installed in the U.S.
2. Opt-in, not opt-out. In this early stage of the market, it seems like programs that are opt-out (sent unless the customer says they don’t want it), not opt-in (only sent if the customer wants it), are the ones working. OPower has been successful largely because it connected with utilities early on, and OPower’s detailed energy bills and energy savings recommendations, are delivered to utility customers automatically. A utility is one of a few types of companies that can send its customers this type of information without getting an opt-in agreement, and the mailed OPower energy bills have a very high open rate, because they look just like a utility energy bill. In comparison, utilities that agreed to participate with Google’s PowerMeter tool (like San Diego Gas & Electric) didn’t seem to be offering Google PowerMeter as an opt-out tool, or else the tool would have had a lot bigger userbase than it reportedly did. SDG&E had 11,000 customers using it, and is reportedly building its own tool. 3. Utility friend or foe? 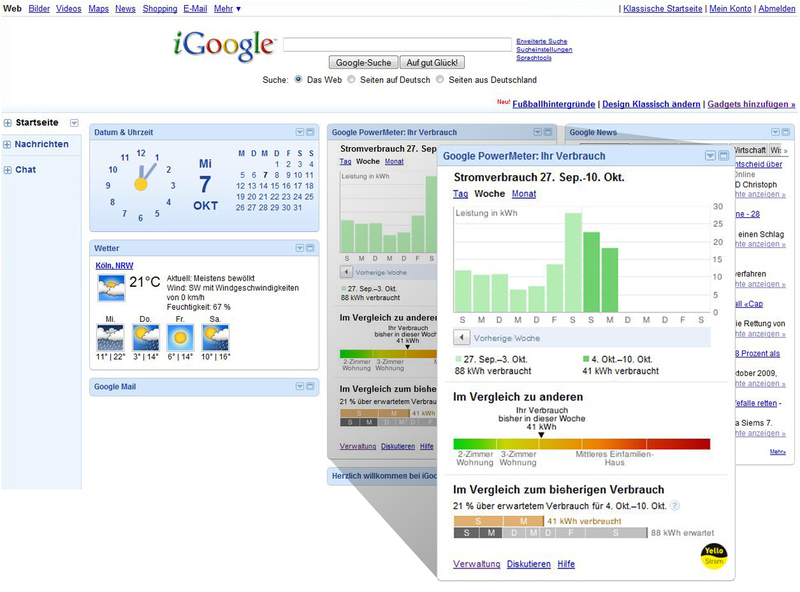 Since Google first launched PowerMeter, some utilities saw the tool as a threat to the relationship they have with their customers. Google’s brand is a whole lot bigger and more consumer-friendly than utilities, and Google has often jumped into industries and sought to disrupt them — from mobile with Android, to city-wide wireless with its Wi-Fi project (clearly with varying success). At the same time, when Google first launched PowerMeter, it focused on connecting with data from smart meters, then later opened its API and connected with gadget makers to circumvent smart meters. Smart meters were in a very early stage then (and relatively still are), and are the end devices for utilities (utilities are behind their installments). I think this place in the middle ground was an awkward position, where they were originally dependent on utility relationships, but weren’t all that good at securing those relationships. 4. Direct to consumer. Perhaps Google would have been better served if it created PowerMeter to go directly to the consumer originally, but did it in its own algorithm-focused way. Earth Aid, for example, uses algorithms to take utility data straight from an online utility account if the consumer gives Earth Aid permission to link that account to its system, and Earth Aid doesn’t need utility partnerships. While Earth Aid also only had “tens of thousands of households actively using the Earth Aid beta,” as of February, this approach seems like it would be a more natural move by Google. 5. Google isn’t an energy company. Google didn’t ever really market PowerMeter, and PowerMeter came out of its philanthropic arm Google.org. It was an experiment, and one that didn’t work. Despite the amount of funding Google has been putting into clean power, Google isn’t an energy supplier or manager at heart. In contrast, OPower has raised over $50 million to invest in its energy management services. Google made a decision that it would only put a certain amount of resources and funding into PowerMeter, and beyond that, Google would pull back. Could Google have ironed out any kinks and raised the tool’s profile if it put more resources into PowerMeter? Google doesn’t care to find out — because energy isn’t at the core of what it does. I had the TED5000 electricity clamp installed on my electric panel a couple years ago when my smart meter was installed by PG&E. I utilized Google PowerMeter, which presented the TED-measured real-time electricity use (and related data) on my computer screen. I could enter the IP address from any IP-enabled device, and view the data wherever I had Internet access. While this provided useful information, it was on average 15% below the concurrent smart meter readings, so I had PG&E’s independent consultant, the Structure Group, come by and check my smart meter accuracy. It was within 1% of actual electricity use. Consequently, I informed the TED PowerMeter User group that the TED5000 plus PowerMeter seemed to be understating my electricity usage by about 15% on average. I also in a separate post indicated that the carbon footprint calculation by the PowerMeter software, calculated in kW, would be more meaningful if stated in kWh (e.g. PG&E’s grid carbon footprint on average is .524 pounds per kWh), since kW is simply the electricity use at a point in time, and kWh measures electrcity use over a period of time. It is not possible to meaningfully convert kW to KWh, or vice versa. And in another post, I indicated that the PowerMeter registered a *decrease* in electricity use when I plugged in my HEPA air filter. I reported these problems over several months to the TED PowerMeter user group, and was eventually blocked from accessing the group entirely. Their lack of responsiveness to these issues clearly demonstrated a lack of will to devote the required resources to make PowerMeter successful. Google doesn’t know what they’re going to miss out on in this energy market. Check out IntwineEnergy.com–these guys know what they are doing. I’ve been using their app and power monitor for a couple years now and it’s great! Getting people interested in power conservation is tricky. Getting people to make any beneficial change is tricky. There’s actually a new user group HabitDesign in SF devoted to understanding and affecting human behaviors as a new topic area. It’s much like the computer-human-interface/UI topic was for software 20 years ago. what utilities want is to maximize their profit. This does not necessarily mean that they have to sell more energy. If they can manage the grid more efficiently, they could get higher profits even if the customers consume less energy. For instance, utilities could get benefit from demand-response management. They would rather avoid spikes of power consumption at peak hours, because this is extremely expensive for them. Changing the price of energy in real time according to demand can help achieve this goal, with advantages for both utilities and consumers. For instance your washing machine can start its cycle when energy demand on the grid is minimum. But without a partnership with utilities, this is not going to work. Early stage or not, if the software did not make concrete suggestions what steps to take to save energy based specifically on each customers appliances and energy use pattern then what good is it? Software has to do more than passively display the situation. I think the value of bill shock is being underrated here — both in the (otherwise great) article and by the folks in green tech who see the issue chiefly in ideological terms. I’m all for clean everything, but I think the best pressure toward that is economic — and therefore really has to be based on the consumer (who hates his electric bill) not the utility (which, let’s face it, can’t really want that bill to go down). Just wondering, for your household, do you spend more money on utility bills or on the communication bills? Communication includes cell phone for all your household members and any of the land lines. Cell phones have time of use data. How often and how much time do you spend looking at your cell phone bills? I was one of SDG&E’s 11,000 Google Power Meter customers & can tell you another part of why it was unsuccessful (that would not have been helped by better consumer awareness): Google Power Meter was NOT a real-time energy monitor â€” Info was 2-4 days old. It was generally very inaccurate with frequent gaps in data and large errors compared to the actual bills. It did not reflect SDG&E’s complicated tiered billing structures and had no proactive notification mechanism so consumers had no idea how much they were spending or how to avoid advancing to higher billing tiers. Finally, it had no way of letting users know what was causing spikes in usage because it only monitored the whole home. Going out of oneâ€™s way to access old, inaccurate, incomplete energy usage data was a complete waste of time. By the way, SDG&Eâ€™s replacement energy charts appear to have all of the same problems, but are even harder to access because they require logging into oneâ€™s SDG&E account. This is a nascent stage in the evolution of the utility industry. Energy usage analysis is a new product which most people don’t yet need (or know they need). Google jumped in too soon. In another 5 to 10 years, as the Smart Grid continues to evolve, people will ‘get it’ and products like Power Meter will become as common as phone apps. I have to disagree that people wouldn’t want to watch their real time energy consumption, people love self-referential tracking, it’s another game that can incite competitive action. The opt in/opt out point is interesting. If it’s right there people will notice, if people don’t even know then how can they get excited? Most consumers don’t visualize how their very small contribution of energy conservation makes a difference. No one has been able to effectively and convincingly demonstrate to individuals that all those small individual changes add up. Rather than generate feelings of higher purpose the Google PowerMeter gained no more buy-in than Jimmy Carter’s cardigan message. Someone will come up with a message that resonates with consumers but it probably won’t be built around the concept of individual conservation. @HT I tend to agree with you on that. One more reason why it didn’t work…. Customers just want to live their life, they aren’t going to watch their energy usage in real-time. In my mind, if customers are given monthly statistics in their bill it does most of what is needed. There is no way you can interest folks other than die hard environmentalists to watch their real-time consumption in order to save at the most $20(may be a little more or less) a month. The other thing most people don’t realize is that it takes at least three years of data to be able to see trends. Many of us with significant seasonal variations can’t do month-to-month comparisons. Yes, you can usually see the trends in one year’s data, but three years of data MIGHT be enough to tell if a new A/C unit really lowered summer cooling usage. Two years can reinforce the general trends but can’t tell if any given month is high or low due to anything specific, for example maybe one bought a new refrigerator, and the following July shows less usage, but was it due to the fridge or the two-week vacation that occurred in the same month?